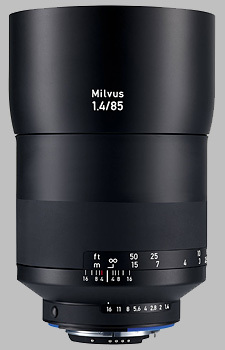 (From Zeiss lens literature) The redesigned ZEISS Milvus 1.4/85 lens is particularly suitable for portrait photography. This lens is an absolute must for compositions where the main subject is to be sharply defined and emphasized against a beautiful bokeh background. The purely spherical optical design and use of special types of glass ensure optimal micro-contrast and extremely low chromatic aberration. The result: outstanding photographs every time -- with the champion of bokeh. The famous symmetric lens design invented by Dr. Paul Rudolph at ZEISS in 1896. The Planar lens is the most successful camera lens design -- and, by the way, the most plagiarized -- ever created. It provides the lens designer with numerous means to correct aberrations extraordinarily well. And its performance is very constant over a wide range of imaging ratios, enabling such a versatile lens variety as the Makro-Planar lens. The Zeiss 85mm f/1.4 Milvus 1.4/85 doesn't have any user reviews yet!